Introducing a bold and colorful shrub that is ideal for filling in tight spaces in the landscape! 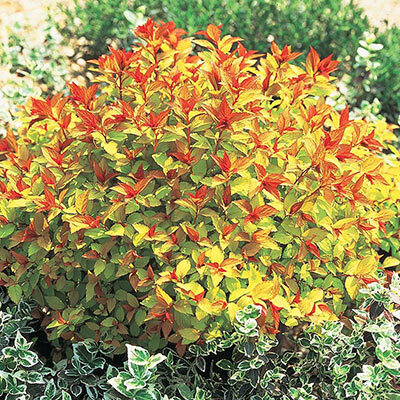 Now shipping in summer in a handy gallon pot, Magic Carpet Spirea grows a compact 12-24 inches tall with a moderate 24-36 inch spread—it's a wonderful choice when you want to liven up smaller gardens. 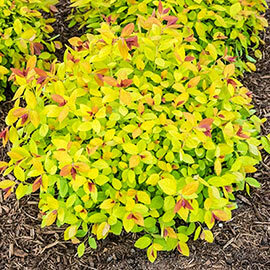 It reliably bears rich gold to green-gold foliage, depending on the amount of sunlight it receives during the day. In summer to fall, clusters of small, fluffy, pink to deep rose flowers bloom in abundance, attracting pollinators, such as butterflies, to the area. 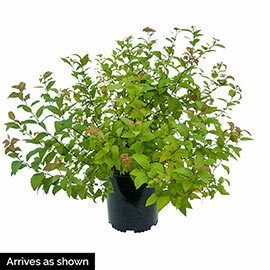 Grows best when planted in full sun. Deer tend to avoid. Potted. Zones 3-8. PP09363.